Fairmont Triathlon (2019) - AllSportCentral.com - Registration. Results. Relax. Youth triathlon (kids ages 5-15) held on Friday June 14th at the Fairmont Aquatic Park. Sprint and Olympic Triathlon, Duathlon and 5K Run all held at Gomsrud Park, Fairmont on Saturday June 15th. The event is professionally timed by AllSportCentral.com. Sprint event distance is: .25 mile open water swim; 20k bike (12.5 miles) on flat county roads; 5k (3.1 miles) run through residential areas. Medals to top 2 in each category, and trophies to top 3 M & F overall finishers. 1.5k open water swim in Budd or Hall lakes (depending on conditions); 40k bike on flat country roads; 10k run through residential areas. THE YOUTH RACE WILL BE FRIDAY, JUNE 14TH!! Race is located at the Fairmont Aquatic Park! AGES 5-8: 25m pool swim (flotation devices allowed),1 mile bike, 1/4 mile run. AGES 9-11: 25m pool swim (flotation devices allowed), 1.8 mile bike, 1/2 mile run. AGES 12-15: 50m pool swim, 3.5 mile bike, 1 mile run. Ribbons and t-shirts to all participants. TEAM CAPTAINS: Must register entire team during registration by first registering as a captain, paying for the entire team, then clicking on the proper link on the receipt page to enter remaining team members. If you need to add or edit team member information after you have registered as the team captain, simply login with the AllSportCentral Athlete account that you used when registering and select MANAGE TEAM ROSTER icon from your Athlete home page. This will allow you to update your team roster. AWARDS: Teams will compete in categories according to the total sum of the ages of the swimmer, biker and runner on race day. Award categories: under 60 years, 60-119, 120-149 and over 150. 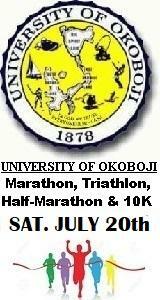 Duathlon Distances: 5k run; 20k bike (12.5 miles) on flat county roads; 5k run through residential area. Medals awarded to top 3 male finishers and top 3 female finishers. Very flat and fast run course on paved trail and residential streets. Water stations along the course. Medals awarded to the top 3 male and top three female finishers.